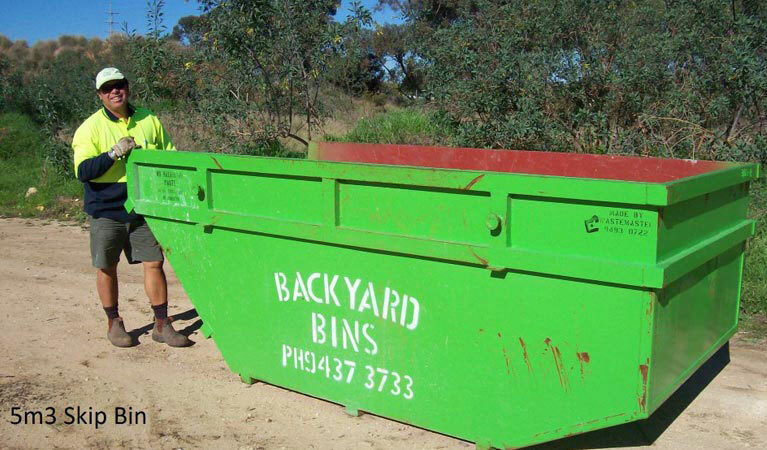 Backyard Bins supplies a huge range of skip bins in all sizes, available for hire across Perth and the surrounding suburbs. Flexible hire periods. If you require a bin for extra time, there’s no extra charge! Servicing suburbs south of the river (and some northern riverside suburbs). 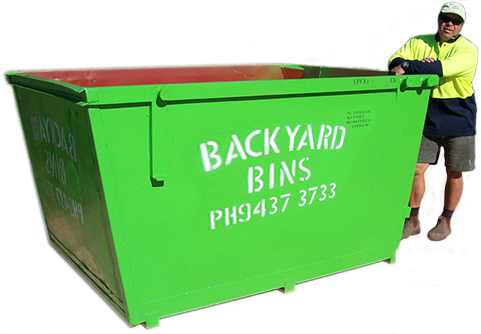 Most of our skip bins have drop down ramps at the back of the bin for wheelbarrow or walk in access, making rubbish removal easy. The only exceptions are the 10m³ bins, which have a low back end. However, this still allows for easy access. HOW DO YOU KNOW WHICH SIZE IS BEST? 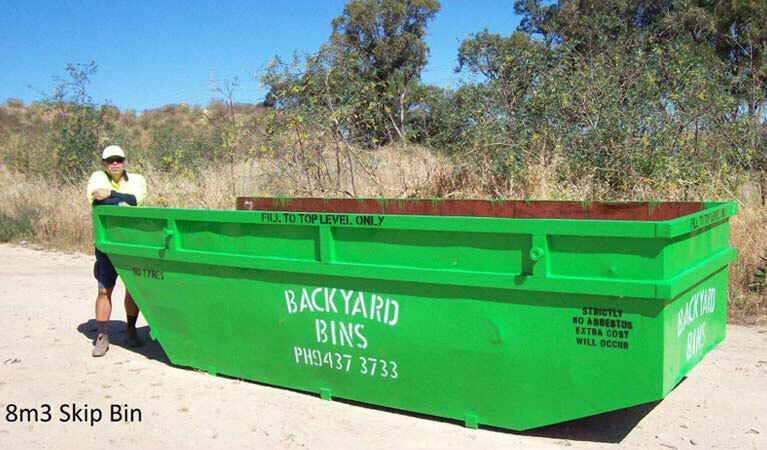 When deciding on what skip bin size is right for you, remember that 1 cubic metre is equivalent to approximately 1 flat trailer load of rubbish. 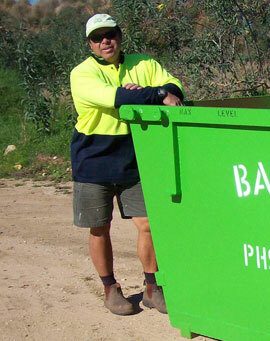 If you’d like more information or guidance, please get in touch with our knowledgeable team and we’ll help you determine which skip bin rental option is the most appropriate for your needs. All of the above measurements are approximate and are taken from the top of the skip bin. 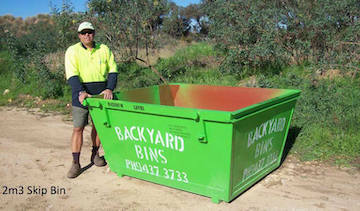 All bins taper down towards the bottom of the bin. 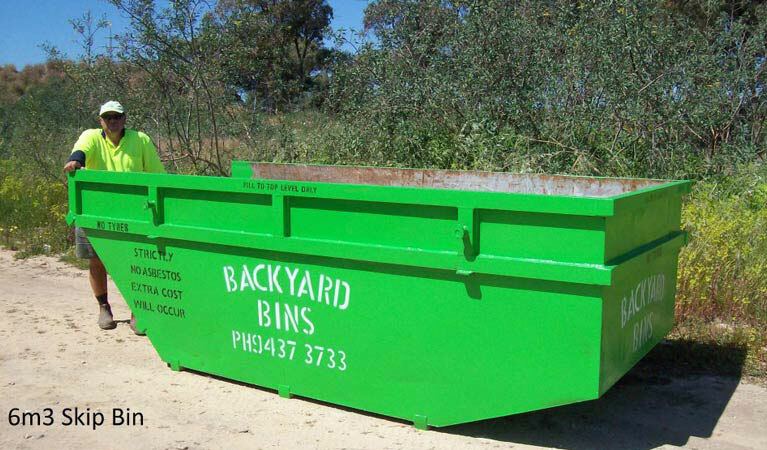 All skip bin sizes quoted are in cubic metres and inclusive of GST. 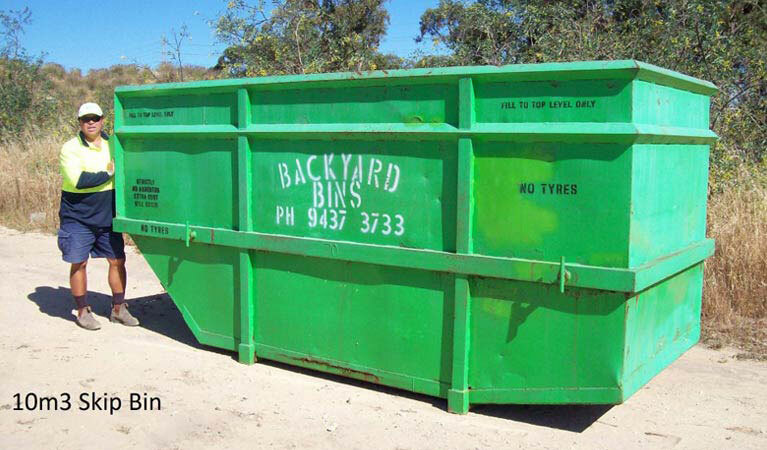 Skip bin hire prices quoted below are for Perth’s south and some northern suburbs close to the city. 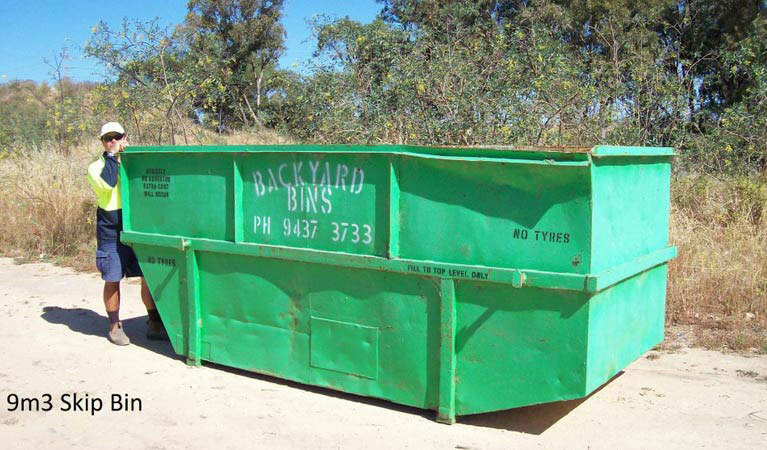 When ordering a skip bin, please make sure you request the right type of bin for your needs. If the wrong products are found in the wrong bin, an invoice will be issued for extra charges. Skip hire periods are flexible. Rental prices quoted are for up to seven days, but if you require a little longer, we will not charge extra rental fees. Please let us know of any changes immediately so we can re-arrange the collection date. General light waste is classed as household junk, green waste (NO tree stumps), timber, furniture, white goods, metals, cardboard, paper, and plastics. 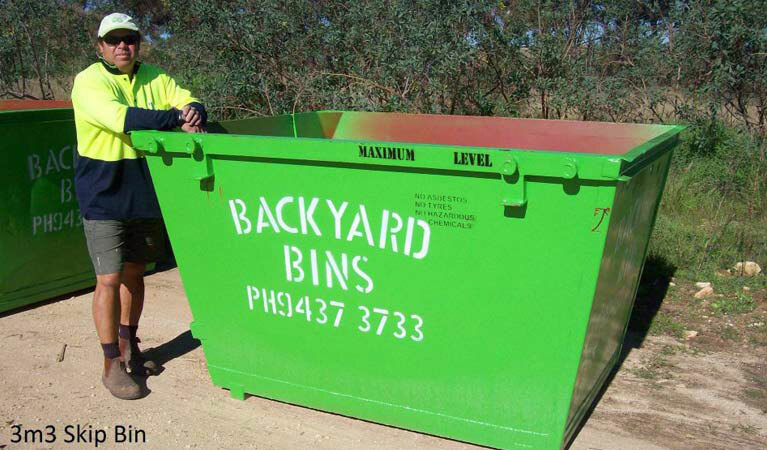 These bins MUST NOT contain any soil, sand, brick, concrete, tiles, building rubble or turf. (See 'Mixed Waste' prices for this kind of material). No asbestos or car tyres in any bin. (See 'Asbestos' bin prices below).Bin hire period is flexible, usually 5-7 days, but if you need longer we don't charge any extra! You can have a mixture of any products in this type of bin, including general light waste, greenwaste (NO tree stumps), soil, brick, concrete, tiles, rubble, and turf. (No asbestos or car tyres in any bin). Oversized concrete incurs extra charges, please enquire first.Bin hire period is flexible, usually 5-7 days, but if you need longer we don't charge any extra! 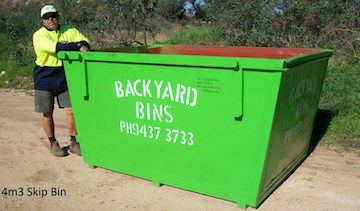 Bins supplied for asbestos are to contain asbestos ONLY. No other waste is to be placed in the same bin. Asbestos MUST be wrapped entirely with plastic, not less than 20um thickness. Each pack of asbestos must contain no more than seven sheets. Each pack must be securely taped so as to prevent asbestos coming free of the wrapping when tipped.No skip bin is to contain any car tyres or liquid waste, such as petrol, oil, chemicals, or any sort of hazardous material. If you have car batteries to dispose of, we will happily take these away for you as long as they are placed next to the skip bin.